General Ashfaq Kayani is acceptable to the Americans and even New Delhi will not mind a military takeover in the present conditions, the former chief of an intelligence agency told DNA. “Our worst security nightmare is Pakistan collapsing, that is what they (the US) have to prevent first, if their Afghan strategy has to win,” he said. “Pakistan imploding is old news, it has been happening for long. It will not collapse right away, but steadily, one brick in the wall at a time,’’ said former diplomat Arvind Deo. “Jihadi forces are in Lahore fighting to create a pure Islamic state. The civilian government has been unable to stop the tide,’’ said Deo. “It’s a siege within now,’’ said strategic analyst K Subrahmanyam. November 27, 2011, NATO air strikes kill 28 Pak soldiers creating a deep rift between two countries. GHQ responds quickly by suspending NATO supply routes through NWFP, and by calling for the closure of Shamsi airbase used for launching Drone attacks by NATO/US. Earlier, Pakistan’s US Ambassador Hussein Haqqani was removed from his post for getting embroiled in a controversial “Memo” from Zardari in the aftermath of May 2nd US attack in Abottabad (Bin Laden’s excecution). Zardari allegedly wanted US protection fearing a military takeover by the angry Generals. Things have hardly been normal since independence, starting with a history of military interventions. Political leaders have time and again failed to make much progress either. Corruption by jobless, and quite often incompetent persons, show up in a ‘rags to riches’ story, expensive cars, houses in posh areas and large windfall profits in commerce. Extravagant lifestyles of the rich and powerful politicians demonstrate the perceived benefit of being in politics. Insecurity, mistrust and disgust for corrupt politicians are further corroborated by the politicians themselves. They accuse their rivals of exactly the same vices that caused public rancor against them, each calling his counterpart corrupt, incapable and treacherous. They provide that much needed credibility for a military intervention, to set things right. Since 9/11 and the aftermath of the US attacks in Afghanistan and Iraq, Pakistan Army slowly lost whatever prestige it had after its detestable part in the 1971 civil war against East Pakistan (now Bangladesh) followed by an ignoble surrender to India (90,000 Pak soldiers taken as POWs by India). Parvez Musharraf changed sides fast enough to go from holding a “Pak-Taliban Brotherly relationship” to “Talibans are Terrorists” to imprint his name amongst world’s top 10 hypocrites of all time. What followed was a more deplorable state of affairs for his government. Sectarian in-fighting, terror attacks in mosques, factionalism, political assassinations, disunity, threats of external attacks, all combined to expose General Musharraf’s true nature as a failed con-man. Pakistanis got rid of him, a little too late though. By the end of his rule, Americans had bases in strategic NWFP, Pakistan Taliban added to an existing long list of Jihadists and an economy badly in need of more funding. Zardari – Gilani duo have pretty much lost their grip on Islamabad, starting with the execution of Bin Laden in Abottabad. Lahore rally of former cricketer Imran Khan drove that point home like a hammer. Satellite TV news programs made that clear as they brought politicians, analysts and academics from differing camps to debate and finally comment on its immense impact. Imran’s rally was quickly followed by Muslim League rally in Faisalabad lead by the Sharif brothers. The removal of Hussein Haqqani was next. It is not difficult to guess who could have called the shots, especially after successful opposition parties’ show down against Zardari. It would not make sense for Zardari to fire his compliant envoy in the most important embassy outside Asia. Pakistanis should be getting ready for another military takeover. 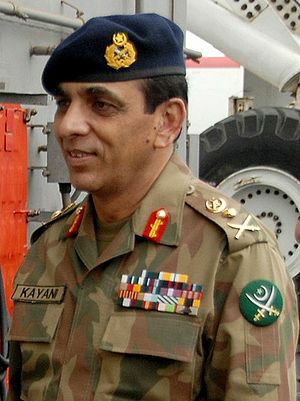 After Ayub, Yahya, Zia and Parvez it will be Kayani’s turn to try and correct lots of things that went awfully wrong. All hopes are on him, dubbed as a professional soldier par excellence. But Kayani is a product of that same old military school that taught Musharraf backstabbing, Zia bigotry, Yahya barbaric mentality and Ayub egotism. Nothing less than a miracle can alter the time-honored tradition of Army Generals. There is too much at stake for change to happen. Kayani will be faced with the issue, “what is good for US, is good for Pakistan”, therefore, Pakistan must bend backwards to please the US administration. Pakistan provides bases for US/NATO operations in Afghanistan, Iraq and maybe Iran in the future. It allows US Drones to kill innocent unarmed citizens. Vital supply lines to NATO in Afghanistan run through Pakistan. It protects foreign interests by killing its own citizens under the cover of “anti terror offensive”. They betrayed the fellowship of the brave soldiers. Pakistan’s future is not in the hands of its Generals. People are making a noise loud enough to reach GHQ, “no more double talking, backstabbing, hypocrites please”. In a country where guns are louder than thunder, people’s voice matter little. It’s the Generals who call the shots, compelling others to obey them by force if necessary. It is this line of thinking that justifies being classified as “trash”. They really have had enough filth from their Generals and politicians alike. It is time for popular revolt to remove a nation’s burden of ambiguity and to usher in an era of internationalism, rule of law and support for righteousness. Islam did not introduce any new religion. Disbelievers of Makkah opposed the Holy Prophet (swm) because they blindly followed the religions of their forefathers. They were stuck in the past, unable to grasp new ideas. They earned the title of “JAHIL” thanks to their ignorance and backwardness. The word ‘Quran does not mean ‘Book, ‘Kitab means Book. It is also not a scripture, ‘Mushaf means scripture. Quran implies reading, reciting or in a larger context recitation with understanding. God’s message did not come to serve any particular group, His Words are for all people. Language of the Quran is classical Arabic, which is different from modern Arabic, using more allegory, descriptive and narrative phrases. To understand the Quran requires a close study of Holy Prophet Muhammad (swm)’s mission and struggles. The Holy Prophet (swm) was meditating in a cave when he received the first revelation. Was it a custom among Arabs to meditate? Budhists are known for meditation not Arabs. Prophet Muhammad (s) had an unusual curiosity for 7th centuryArabia. Meditation helps search for inner peace, spirituality, religion, God, eternal life, calmness, relaxation, and tranquility. It makes the mind enter an ideal level for “thinking’ clearly. It flushes out all the negative thoughts and brings in positive energy. He (s) must have thought about the social conditions in his surroundings, searching for the Truth, wanting to know the real purpose of life in this world. Syedena Muhammad (s) was ‘thinking’, asking questions, searching for answers, looking for solutions to life’s problems. At such an higher thought level Holy Prophet Muhammad (swm) received the first Word of God. God’s first instruction to humanity is ‘READ. Literacy and education are similar but not equal. An illiterate man can still choose to be educated. Recite, contemplate, understand etc are all connected to Read, and to become an educated personality who lives in a civilized world. Otherwise man will live in ignorance, living under the mercy of another man, in a humiliated status of slavery, mental or physical. God’s first order for humanity is to break free from slavery. Man should never be subjugated by another man, or nation, or by any system made by another man. To live an honorable life is the birth right of every person. The Holy Prophet (s) searched for answers and he got it from God, “READ” – IQRA, liberate yourself from all forms of slavery. The Holy Qur’an is the Word of God Almighty, a Guidance for mankind, to change their conditions, from darkness to light. The message of the Holy Qur’an is one of constant change, always flowing away from stagnation, running towards progress. The exalted Prophet (s) was the chosen leader for this Qur’anic movement. He (s) would fight against all odds to set up the final message of God on earth. Qur’anic generation was born in Makkah with the prophethood of Muhammad (s) for all mankind and for every generation and for all times. Prophets before him came and established religious rites, rituals and basic laws of governance. But Prophet Muhammad (s) had the most challenging assignment of them all. He (s) had to struggle against all the established priesthoods, idols, mental stagnation and blind followings. He (s) had to deliver the Quran for mankind to continuously keep reforming themselves and to fight against the forces of evil. This Quranic message was the mission for the last Prophet of God, Muhammad (swm).